If you have an interest in art and enjoy communicating with people, you can be a Philbrook Docent. The word docent is derived from the Latin word docere, meaning to teach. Philbrook docents are knowledgeable, enthusiastic volunteers who act as liaisons between the Museum and the general public. What do Philbrook Docents do? 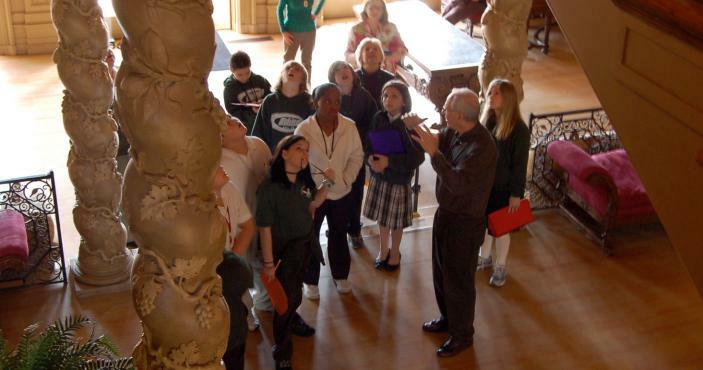 Touring: Docents serve as guides for tour groups of both children and adults. Docents also help every-day visitors get the most of their Philbrook experience. Research: Docents assist the Philbrook education staff in preparing background information on works of art in the Museum’s collection, special exhibitions and new acquisitions. Outreach: Docents give presentations to schools and community organizations. Facilitate: Docents conduct art activities with Museum visitors to further enhance the experience. What does the training program involve? Docent Intern Training prepares prospective docents to conduct tours of Philbrook’s permanent collection and facilitate Museum-related activities. An art history or education background is not required–the intern training will provide the learning necessary to become a successful docent. Philbrook docents come from a wide range of professions and backgrounds. How much time and commitment will be required? Docent Interns meet Tuesday from 9:30 a.m. to 12:30 p.m. over nine months. Additional hours are required for practice tours and attending various Museum-related continuing-education opportunities. Docents are required to be members of the Philbrook Museum of Art and are expected to complete 25 touring hours for the first two years, and obtain five continuing-education credits per year. Why should I consider becoming a docent? Docents gain life-long learning opportunities in the arts, enjoy the camaraderie of fellow docents and Museum staff, and earn the satisfaction of sharing their knowledge with Museum visitors. Please complete the Docent or Volunteer Application Form and the Education Coordinator will contact you directly.